This year’s Phi Beta Kappa Teaching Prize winners were (from left) Philip Fisher, Alison Simmons, and Thomas Torello. 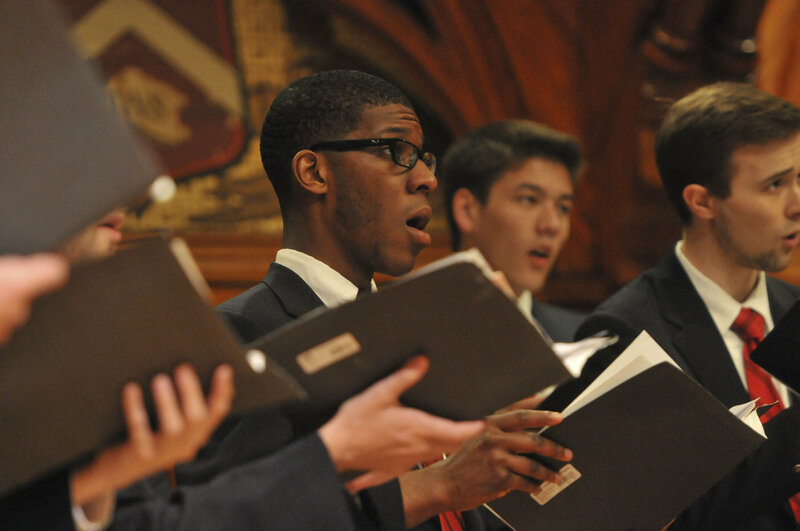 The Commencement Choir performed “The Road Not Taken," a setting by Randall Thompson ’20 of the poem by Robert Frost ’01, Litt.D. ’37. In the formal Alpha Iota Chapter business that preceded the poems and oration, president Ann Pearson, Ross professor of environmental sciences, oversaw the ceremonies. (Read the Literary Exercises program.) In a brief speech, she traced the origins of PBK to five students who founded the original chapter at William & Mary in 1776, at the outset of the American Revolution. Recalling the society’s mission to promote critical thinking as “the guide to life,” Pearson invited the new PBK members to ensure that “future students around the world can study the liberal arts and sciences with the same freedom and passion” that they have found at Harvard College. The Reverend Jonathan Walton, Pusey minister in the Memorial Church, Plummer professor of Christian morals, and professor of religion and society at Harvard Divinity School, offered the invocation. During the exercises, the Commencement Choir performed Jeffrey Douma’s “Who Is Wise?” conducted by director of choral activities Andrew Clark, and later Randall Thompson’s “The Road Not Taken” (from Frostiana), conducted by University organist and choirmaster Edward Elywn Jones. Wolcott professor of philosophy Alison Simmons, who studies early modern philosophy and philosophy of mind. 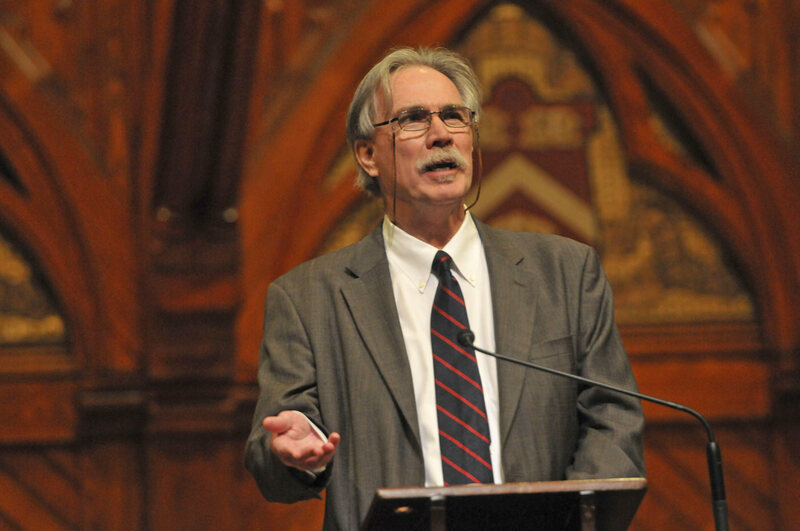 Simmons, who co-led the effort to create the General Education curriculum, also spoke at the launch of The Harvard Campaign last September, in a panel on the future of knowledge. She teaches Philosophy 8, “Introduction to Early Modern Philosophy,” Philosophy 191, “Philosophy without Borders: India and Europe,” and several reading and research graduate courses. According to the nomination, Simmons not only “makes difficult thinkers comprehensible” but is also extremely dedicated to her students, whom she advises and engages in conversation during her “legendary office hours.” Tarrant mentioned that “Philosophy without Borders,” as one of Simmons’s courses is titled, is also a description of her approach to the discipline. Thomas Torello, lecturer in molecular and cellular biology, who teaches Molecular and Cellular Biology 52, “Molecular Biology,” Molecular and Cellular Biology 91r, “Introduction to Research,” and Molecular and Cellular Biology 99, “Laboratory Research for Honors Theses.” Torello was cited for his excellence in advising and mentorship, for fostering interactive learning processes, and for establishing a senior-thesis workshop. Daniel Aaron, Litt.D. ’07, Thomas professor of English and American literature emeritus, winner of the National Humanities Medal, who contributed to the 1979 founding of the Library of America. Aaron was the first to receive a graduate degree in American civilization from Harvard in 1937. After teaching at Smith College for three decades, he returned to Harvard in 1971. Born in 1912, Aaron celebrated his centennial two years ago in his office at the Barker Center. That same year, he was awarded the Harvard Graduate School of Arts and Sciences Centennial Medal. Donoghue praised Aaron, who was not present at the ceremony, for a career that spanned 70 years. He remarked that the retired professor still works in his office every day and has just finished writing a soon-to-be-published book. Lowell K. Halverson ’64, a semi-retired lawyer who served the Washington State Bar Association as a member and president of its board of governors. Halverson also founded the Legal Foundation of Washington in 1984 and became its first president. According to Donoghue, Halverson’s sense of social justice was already strong during his undergraduate years: as a College freshman, he participated in one of the earliest freedom rides in Maryland. Halverson was also cited for his work in favor of the economic and civil rights of Native Americans. Sheila Sen Jasanoff ’64, Pforzheimer professor of science and technology studies at Harvard Kennedy School. A mathematics concentrator at Radcliffe, Jasanoff earned a Ph.D. in linguistics and a law degree from the University. She is one of four Jasanoffs at Harvard, along with her husband Jay, Diebold professor of Indo-European linguistics and philology, their daughter Maya, professor of history, and their son Alan, a tutor in biochemical sciences at the University and an associate professor of biological engineering at MIT. Donoghue commended Jasanoff’s “diverse intellectual interests” as well as her central role in the field of scholarship that focuses on the intersection of science, technology, and governance. Barbara Ricks Krimgold ’64, director of the Institute for Alternative Futures, a consulting firm that focuses on development strategies. A former budget examiner at the U.S. Office of Management and Budget, director of several health NGOs, and a member of the board of directors of the International Society for Equity in Health, Krimgold has served in a variety of positions. According to Donoghue, she has dedicated a significant portion of her career to reducing health disparities based on race, gender, ethnicity, and socioeconomic status. Rabbi Mark Leonard Winer ’64, professor at St. Thomas University, Florida, and director of its Center for Ecumenical and Interreligious Studies. Winer has served as a leader of several religious and interfaith organizations, including the World Union for Progressive Judaism, the National Council of Synagogues, and FAITH: Foundation to Advance Interfaith Trust and Harmony, which he helped found in 1995 and has chaired since. He was cited for his work on international interfaith reconciliation and the alleviation of Jewish persecution. Donoghue also mentioned that Queen Elizabeth II recently named Winer a Member of the Order of the British Empire for promoting interfaith dialogue in the United Kingdom. Born in the Bronx, Revell received his bachelor’s degree from Harpur College, his master’s degree from Binghamton University, SUNY, and his Ph.D. from the University of Buffalo. Now a professor at the University of Nevada, Las Vegas, Revell has received a number of awards and prizes throughout his literary career, including a Lenore Marshall Award, a Gertrude Stein Award, two PEN Center USA Awards in poetry, two Shestack Prizes, and two Pushcart Prizes. During the ceremony, Robin Kelsey, Burden professor of photography and chair of the department of history of art and architecture, praised Revell’s poems for their “open-minded conviction” and “humane sincerity,” which he said are rare in poetry. Kelsey also called Revell “a true man of letters,” citing his five volumes of translations of French works and his literary critiques. A biology concentrator at Union College who now teaches English at Williams, Barrett has infused her love of science into her novels, where many characters are scientists, often nineteenth-century biologists. Among the honors she has received are a MacArthur Fellowship and the National Book Award; she was also a finalist for the 2003 Pulitzer Prize for Fiction. 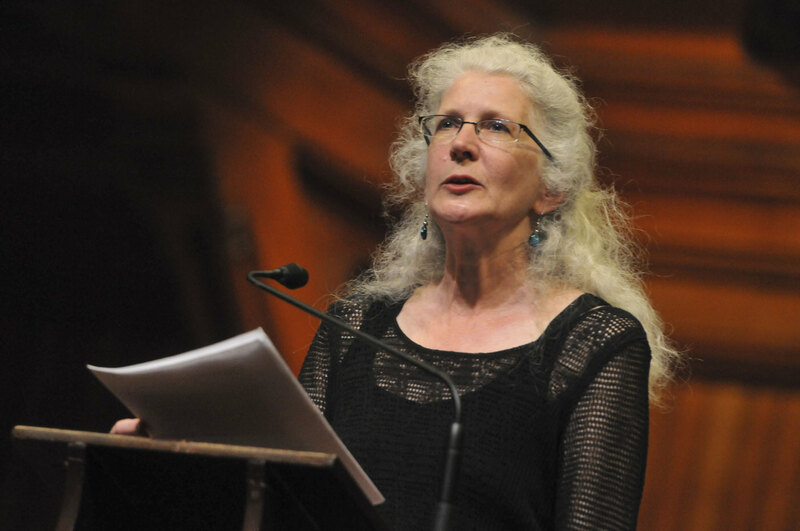 In introducing Barrett, Ann Pearson said that themes underlying her novels and stories capture the connection between the world of science and the world of art. During her oration, which carries the same title as one of the short stories in her 2013 collection Archangel, Barrett recounted the life of physicist Oliver Lodge, who attempted to reconcile science and religion, to show how stories can change in meaning and significance according to the perspective with which the writers themselves and readers approach them. (The oration also appears in the sidebar, above.) 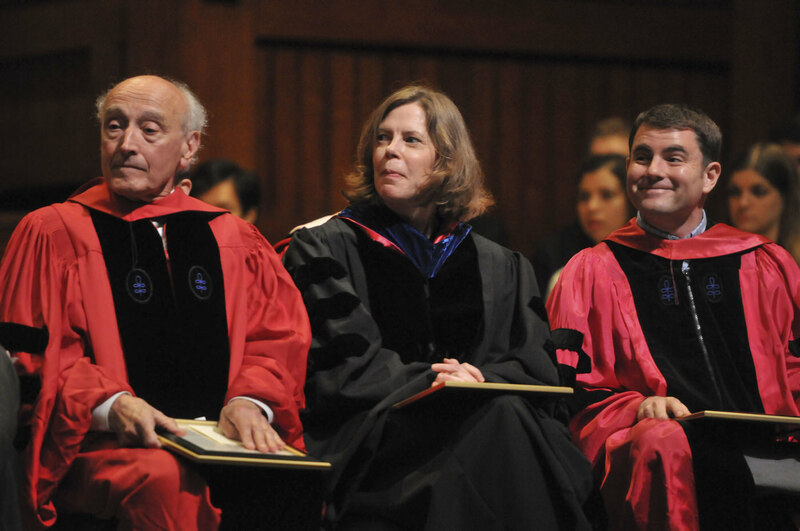 Citing Lodge himself, she concluded that “everything is interlocked,” and she encouraged the graduating class to embrace “all the complexity and contradictions” of the comprehensive and interdisciplinary knowledge that they acquired thanks to Harvard’s liberal-arts education. At the conclusion of the exercises, Reverend Walton gave the benediction.